If you're a sandwich lover, you're not alone. The perfect sandwich can be a satisfying. Of course, to get it right you'l need to start with the perfect base. Find the right bread with these tips. The perfect sandwich is constructed by using all the right ingredients. One of the most important ingredients to focus on is the base of your sandwich, in other words, the bread you choose for it. At first glance, the bread may not seem all the important, but it can make the difference between a sandwich that holds all of its ingredients in and one that falls apart. Learn more about some of the most popular sandwich breads below so that you can get it right every time. Brioche is a light french bread that has a subtle sweetness to it. A loaf will be light, soft, and squishy. Although not a sandwich, this type of bread is often used to make the most delicious of French toast. Because of its subtle sweetness and soft texture, brioche is good for all sorts of sandwiches, including savory and sweet options. Bread rolls provide a much more sturdy base for a sandwich than something like a brioche. Since they tend to be thicker and more sturdy, they're ideal for holding in heavier ingredients and for sandwiches that can get quite saucy. Since this type of bread doesn't have any holes in it, you can be sure your sandwich won't fall apart mid-bite. If you're planning to make a meatball sandwich or a pulled pork sandwich, reach for a bread roll. Is a wrap a sandwich? While this may stir up some debate, pita bread is called bread so it's worth including in this list. This flat, rollable bread is perfect for on the go options. Pita bread is also quite versatile because the pocket it forms while baking can be stuffed to create your sandwich or ingredients can be rolled in it like a burrito. Sourdough is a classic when it comes to sandwich bread options. It's crusty exterior, soft interior, and distinct flavor make it a favorite among the masses. A sourdough slice will have some holes in it, but classic sandwiches will do just fine. A BLT or a grilled cheese sandwich is the perfect way to go when slicing up a sourdough loaf. Focaccia is an Italian flat white bread that can be described as soft and moist. It's often flavored with herbs, spices, and a bit of olive oil, giving it just the right amount of flavor. Mediterranean flavors pair perfectly with this type of bread, so reach for some feta cheese, olives, and other mediterranean flavors. Don't have time to make your own sandwich for lunch? Great Harvest of Newtonville has you covered! Give their bakery a call at (617) 928-1162 to check out their lunch menu and order your favorite sandwich option. You can also stop by Great Harvest of Newtonville to check out all of their baked goods and catering options. Although baguettes are quite long, they are often cut up into thinner slices of bread, making it some of the lightest bread for a sandwich. This white, chewy loaf is often sliced up and paired with brie or simply with some butter. This doesn't mean you should limit yourself to a single ingredient. A baguette will be perfect for open face sandwiches, so pile on some pesto, tomato slices, and some cheese, or whatever flavors you please. Croissants are light, flaky, and buttery thanks to their baking process. To achieve the many flaky layers in a croissant, the dough must be layered with butter multiple times before it's ready to be cut up and put into the oven. A plain croissant will be buttery light, perfect for most classic sandwich options. They're also often used for breakfast sandwiches, like a sausage and egg option. Ciabatta is another Italian white bread option that has quite a neutral flavor and a hard crust on the outside. Inside the loaf, you'll find a soft texture that makes it a popular sandwich option. It's often stuffed and pressed down to create the popular panini. Whole grain bread is a healthier option that is used to make all sorts of sandwiches. 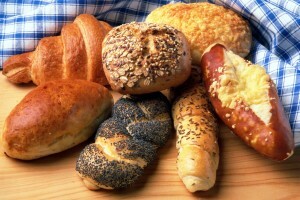 What makes whole grain bread different is that the flour used to make it includes the entire wheat grain. This means it has more nutrients and fiber in it than normal white bread. Try pairing with healthier ingredients that compliment its taste. Spread some hummus on it and add in some leafy greens, tofu, and sprouts along with your favorite sandwich ingredients. Rye is recognized for having a strong, earthy flavor that is the result of combining bread flour with rye flour. Different types of seeds will often be added into the dough to give it an even more distinct flavor. Pastrami and corned beef sandwiches will often be served on rye. Plan the perfect event with a bit of help from Great Harvest of Newtonville. To learn about their catering options or to put in an order, give the best bakery in town a call at (617) 928-1162.